Located in the outskirts of one of the world’s most amazing volcanoes in a world of comfort and style surrounded by an untouched natural paradise is Arenal Nayara Hotel & Gardens. At Arenal Nayara Hotel & Gardens, you will find a unique blend of local culture hospitality and warm tropical climate, making your Costa Rican vacation an unparalleled experience that soothes your senses and rejuvenates your spirit. Make one of their 24 deluxe casitas your home in this lush and verdant natural wonder, where simply waking up to the wondrous sight of the Arenal Volcano is an experience in itself. Every tourist who wants to go to Cerro Chato, one of the most famous nature walks in Costa Rica, must pass through the grounds of the Lodge. Guests at the lodge, however, do not pay any additional fees and have the self-guided hike to Laguna de Cerro Chato included in the room rate. The Lodge has 10 beautiful and very comfortable rooms which are beautifully decorated and furnished. There is also a breakfast and restaurant service. 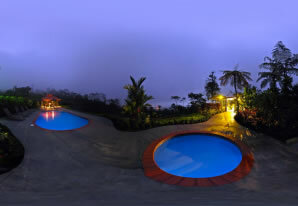 The lodge also has a pool with a panoramic view and a jacuzzi and pool bar and snack bar. 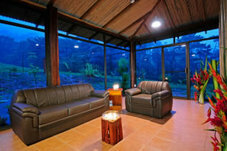 In addition, there is a Spa located in a remote part providing serenity where the guests can relax by the various treatments offered as well as the view and fresh mountain air. 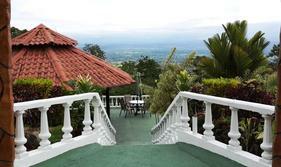 You can see the plain of San Carlos, Arenal Volcano Crater, the town of La Fortuna and mountains and valleys everywhere from the lodge property. Transfers from San Jose area hotels or San Jose’s Juan Santamaría International Airport to hotels in the Arenal area are $170.00 each way, for a minivan with a capacity of up to 9 passengers. Approximate time from San José to the Arenal area is approx 2 hours and 45 minutes. Transfer from Juan Santamaría International Airport to any hotel in San José $35, including airport assistance, for a minivan with a capacity of up to 9 passengers.